Treat vegetarians to a bold meatless entree with a bowl that combines quinoa, grilled eggplant, grilled mango and mango sambal. The mix of sweet, hot and herbal flavors pumps up the dish and wakes up the taste buds. To make the recipe vegan, simply omit the feta cheese. Prepare grilled eggplant: In medium bowl, whisk 2 tbsp. olive oil, lemon juice and harissa powder; season with salt to taste and set aside. Preheat grill to high. Grill pepper quarters, skin side down, until charred and cooked through. Reduce heat to medium on grill; pour remaining 3 tablespoons oil onto large rimmed baking sheet. Place sliced eggplant on prepared sheet; turn to coat. Sprinkle with salt and pepper. Remove eggplant and grill 10 minutes until charred in spots and cooked through, turning occasionally. Return cooked eggplant to oiled baking sheet. Add grilled peppers to sheet; toss both with reserved harissa mixture. 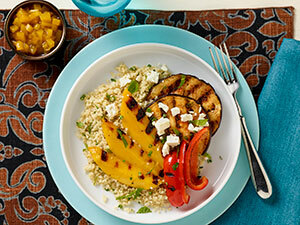 For grilled mango, in large bowl, combine all ingredients except mangos; whisk well. Peel mangos. Cut cheeks from mangos and trim remaining flesh from pit. Add the cheeks and larger pieces to the mixture in bowl; marinate 30 minutes to 1 hour. Reserve smaller mango pieces for sambal. Preheat grill to medium-hot. Remove mango cheeks from marinade, reserving marinade. Place mango pieces on grill; cook 8 to 10 minutes, turning mango until cooked through and caramelized. Prepare sambal: In large saucepan, combine chopped mango and remaining ingredients. Cook over low heat 8 to 10 minutes to help set ingredients; cool immediately. To assemble, divide quinoa, grilled eggplant, grilled mango and mango sambal among 10 bowls. Drizzle with reserved mango marinade and sprinkle with feta cheese and herbs.